Scientific studies have proved that one of the most effective drug-free treatments is based upon the ancient Chinese principle of acupressure – effectively acupuncture without needles! This is available as the Sea-Band. The Sea-Band applies continuous pressure on the P6 (or Nei-Kuan) point on each wrist using a plastic stud. The product comes with instructions on how to find this spot on your own wrists. The fact that acupressure can prevent and ease morning sickness was first scientifically proven in the United Kingdom by the late Professor John Dundee from Queen’s University, Belfast. In 1988 his report in The Journal of the Royal Society of Medicine showed that the women in the trial who used acupressure had suffered significantly less nausea and vomiting than those who didn’t. Sea-Bands can be worn on each wrist whenever you feel nauseous. 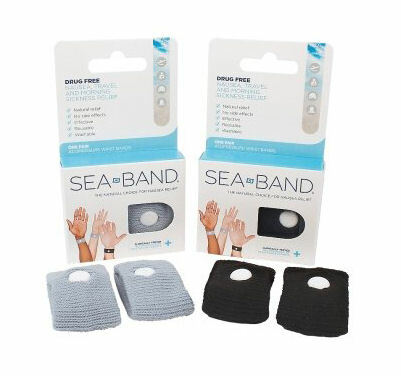 The Sea-Band is comfortable, washable and discreet. One size fits all. Color Will Be Grey or Black. Purchase Sea Bands Acupressure Bands from our retail website, BabyHopes.com.